My day to day in the office varies. Most days are slow and steady which gives me plenty of time for writing and researching different real estate topics. Other days can be hectic with phones ringing left and right with so much work to do in between. Today was one of those days when I get to break free from my ball and chain (my very nice and tidy desk, big screen computer and A/C) and go out into the field with MC’s Sales and Marketing Specialist, Kyle. Needless to say this was quite a little adventure into the real estate world. Kyle’s clientele varies depending on what our different buyers are looking for. He has buyers looking for anything from single family homes to churches (yes MC Properties can help you buy and sell a church). The buyers that we met with today were an eager couple with no children looking for a home to buy in the Independence area. They were buying with all cash and ready to put money down on a property today. Cute 2 bed 1 bath with a spacious backyard and unfinished basement! We met the couple at our property on Roberts. 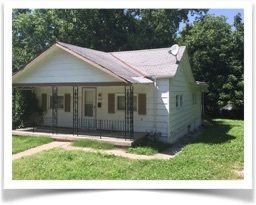 This house is tucked away in a quiet little neighborhood just a couple mins from 24 Highway, a well traveled road in the northeastern metro area. This single family bungalow is a nice one level home with an unfinished basement and needs minimal rehab work. The couple just fell in love with the back porch and ample amounts of shade that the trees provided on such a hot day. Once we made it inside the couple was even more impressed. The house was very cool inside and well insulated. Although small, the home has spacious rooms and plenty of closet and storage space. The wife was anxious to buy and stated her price, which ended up being a few thousand less than the original asking price. Kyle and the buyers discussed a few numbers but the buyers were interested in viewing another property. So our adventure continued down the road to the next property. Literally speaking…down the road. Another 5 minutes down 24 Highway we came to the other property the couple was interested in. This was also a single family home tucked away in the trees. This home has a very roomy sitting area and the bar in the kitchen adds a nice touch. The master bedroom is on the main level with the secondary bedroom and sitting area upstairs. After looking around for a few minutes the couple decided that the home on Roberts would be a better fit for them. The couple talked for a moment and then offered Kyle the same price that they had offered earlier. After discussing the rehab work that was needed for the property and all the benefits the home currently offers Kyle and the buyers were able to come to an agreement and shake on it. They arranged for the couple to meet us back at the office so Kyle could have them sign the necessary documents. About thirty minutes after our return the couple walked into the office with check and pen in hand and left a contract and a grin! After spending about two hours in 95 degree weather and running into a few road blocks I would definitely call this adventure a success. A great way to end the work week. Good job to the MC Properties sales team! And good luck to our new buyers!